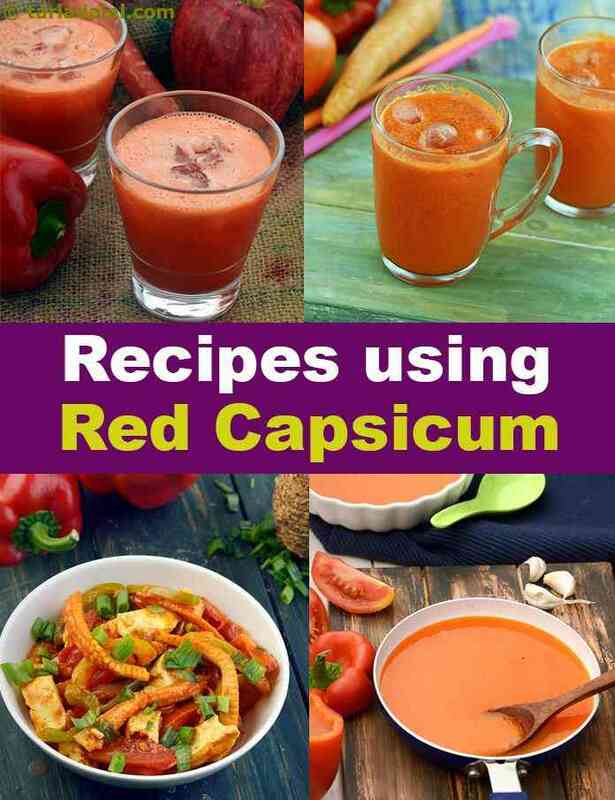 red capsicum recipe collection. bell pepper recipes. Red Capsicum is from the family of capsicums and is more mature than the green or yellow capsicum. They are also known as bell peppers due to the bell like shape that they have. They are sweet, juicy and crispy and are added to a lot of food preparations. Even though originated in South America, they are now found in many parts of the world. Red capsicum is such a vibrant vegetable to see and to eat as it is really delicious and also extremely popular among all cuisines. Because of the bright red color, it adds a pop to your food and even makes the kids like it a lot. Pesto and Roasted Red Capsicum Bruschetta is a medley of the freshness of basil and sweetness of the capsicum. Another fun party starter is Baked Potatoes with Broccoli and Red pepper. A definite serve to impress dish, this starter becomes all the more tasty with the addition of cheese and cream. Moreover, you need not add red capsicum to your starters, instead just add them to the dips to serve with the starters! Roasted Bell Pepper Dip is the easiest way to use up leftover capsicums. Roasted brings out the flavor ten times more, making the dip for more flavorful! Other dips you can make are Red Capsicum and Walnut Dip, which is of a Lebanese background to be served with lavash and pita bread and a more a chunky one, Broccoli and red capsicum dip. This particular vegetable got introduced to India fairly late but it is fiercely catching up! From addition to subzis and tikkis, it is slowly making its place. Paneer and Red Capsicum Subzi is the perfect example to prove that. Just add the regular masalas of Indian cuisine to this combination and voila, you have a new exotic subzi. Same way you can even make Baby corn and Paneer Jalfrazie or experiment with different vegetables. The best way to make kids eat anything healthy is to make it colorful. Herbed Capsicum Paratha does exactly that! It combines all three colorful capsicums together to make one tasty, slightly crunchy paratha. This paratha can be had plain or with Dahiwale Simla Mirch, which is bell pepper cooked in a thick potato, besan and curd gravy. Other countries have been using this vegetables way more than us Indians and hence it is present in many dishes all around the world. It can be added as a topping to Pizzas and pastas or you can make the pasta sauce with it instead of tomatoes! Fusilli with Red pepper sauce or you can use any shape of pasta you like, just improvise on the go! The delectable flavor of roasted capsicum comes out in the Roasted Tomato and Capsicum Fondue which is to be served with bread or other vegetables! Thai Salad with a Peanut Dressing is a combination of crunchy vegetables and a highly flavorful, garlicky peanut dressing that wins anyone's heart! Red bell peppers are also widely used in Chinese and other Asian cuisines. Pan fried Noodles are served with a mix of vegetables over the noodles for a unique Chinese dish. Mexican food is usually perked up with these crunchy peppers in almost all dishes like Broccoli, Bell Pepper and Cheese Quesadillas! The mild sweetness and slight tanginess of Red Capsicum is tastes amazing in a liquid form. The classic combination of tomatoes and bell peppers really heightens in the Roasted Red Capsicum and Tomato Soup. Not only is this soup delicious but is also fiber rich for good health. The same way there is Oats and Roasted Capsicum Soup which is highly pleasant yet nutritious. You can even add capsicums to juices with other vegetables to get the most out of its nutrients and taste, for example Red Capsicum Carrot and Apple Juice. Hope you enjoyed this collection of Red Capsicum Recipes. Scroll down below for more interesting recipes.